The divorce process can be a challenge for anyone, but when one or both of the parties are on active duty with a branch of the armed forces of the United States, there are a number of land mines just waiting for you. Here are some of the issues you need to address. In Texas, as in most states, there are residency requirements for filing divorce. Texas does allow a divorce to be filed in the state if one of the parties is a legal resident, but the minimum requirement for residency is six months. In addition, the party filing for divorce must reside in the county of filing for 90 days before the filing. Of course, when deciding where to file, one significant consideration is how the state will divide assets, including a military pension. Under federal law, the state in which a divorce is filed always has the discretion to divide a pension according to its laws. Because Texas is a community property state, any assets accumulated during a marriage will be considered community property and must be divided equally. 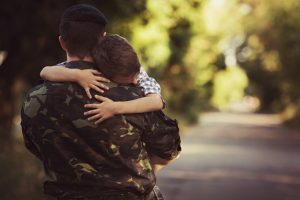 Custody and visitation can be particularly complicated in a military divorce. First, it’s important to understand that the simple fact that you are an active duty member of the military cannot be used to deny you custody. The courts will consider the “best interests of the child,” but will always recognize that the needs of the military will come first. The most important thing to do, if you are involved in a military divorce and have minor children, is to put together a parenting plan. That plan should include an agreement as to what will happen if the military member is deployed overseas, or transferred to another state or far away. As a general rule, when parents have joint custody, the civilian parent will always take care of the minor child when the service member is away on active duty. If the military parent has sole custody, though, allowing the ex to have custody may be considered a legal change of custody, so it’s fairly common that the court will grant temporary custody to some other family member, such as a grandparent. For experienced counsel in family law matters, contact our office online or call us at 972-445-1500 (toll free at 877-613-5800). Your first consultation is free of charge.